👋 Hey! Before you read the article we just wanted to say thank you. Your on-going support, love and feedback on our articles as well as browsing our independently picked recommendations (which earn us a commission and help pay our passionate writing team) keep this little independently owned business going. So again, thank you. We look forward to showing you the magic we can bring in 2018! Play tents are a great way to keep your little ones going for hours! Play forts are great – you know, the ones where you utilize all of your kitchen chairs, wooden clothesline clips, and layers of old sheets, blankets, and pillows to create a secluded play area that, for kids, seems to transport them to their own little world of endless possibility! Those forts, however, take up a lot of space. I know moms and dads will understand when we say that, somehow, we seem to be called to fix the fort over, and over, and over, and over again as rough and excited play pulls the sheets down or knocks over a few chairs. Not to mention that come dinner time, you have to de-construct the fort so you can have your chairs back! Now, we’re not against a good DIY play fort, but if you’re looking for something that will save you the time, effort, and space, and can be used inside or outside, we’ve got just what you’re looking for! We have put together a list of the best play tents which include various themes, sizes, and budgets! Use this table to compare the best play tents and choose the right one for your little ones! 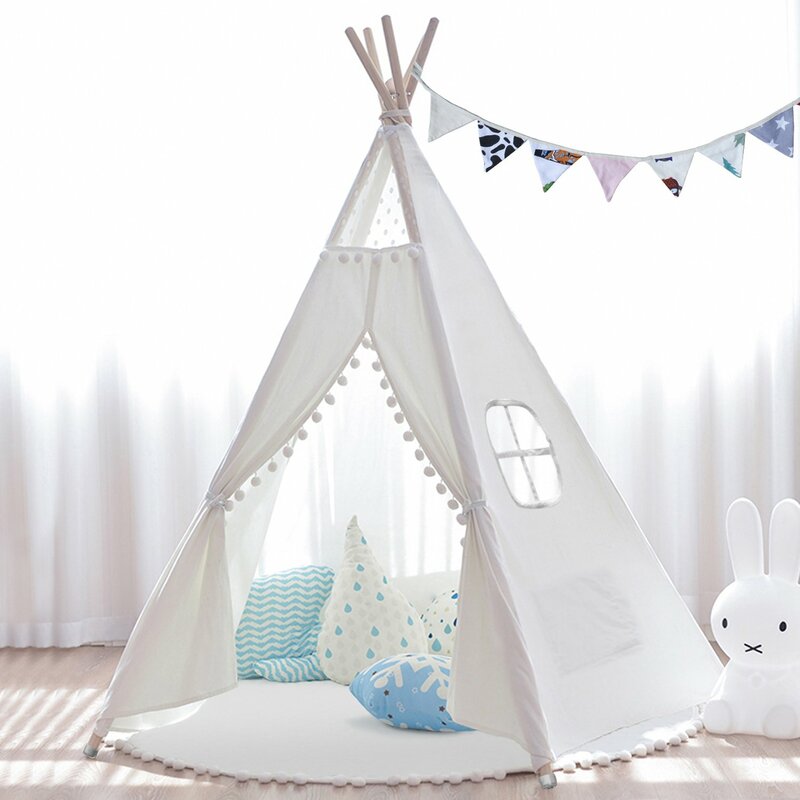 This whimsical, canopy-style play tent is perfect for indoor use, but can be used outside too! 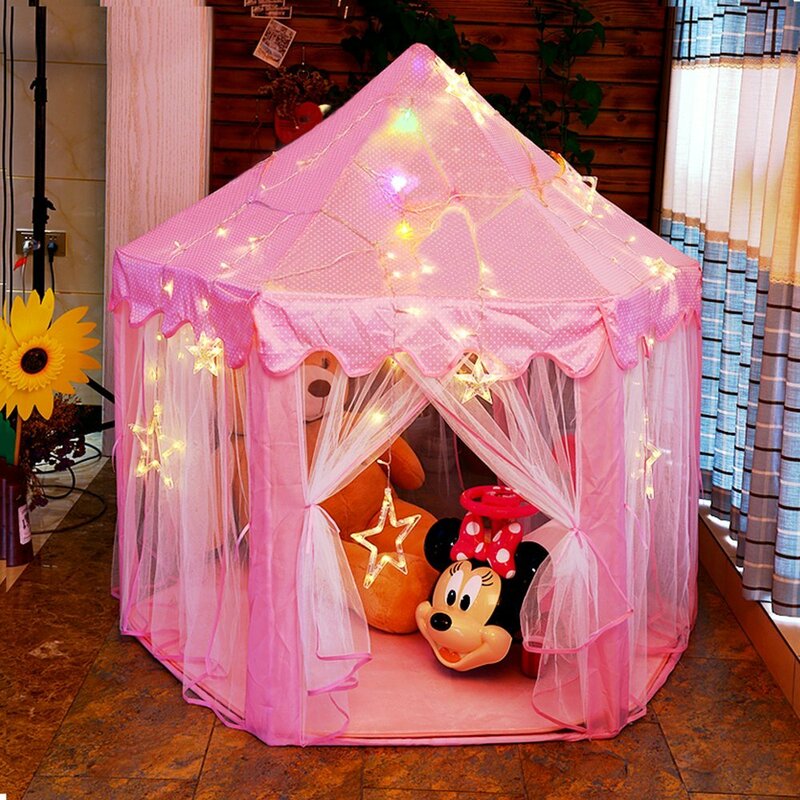 Your little princess will love the beautiful hanging star lights, which really do light up! The lights run on 3 AAA batteries, so you don’t have to worry about keeping the tent near an outlet. It is large enough for your little one to stand in and spacious enough for many toys, pillows, and blankets. The tent is constructed of sturdy PVC pipe and connectors and sheer polyester curtains which allow lighting to enter the tent. The set includes a soft mat for the floor. The set also includes a carry case which allows you to easily store and transport the tent. Your little one will embark on an adventure through space and time with this versatile tent set! 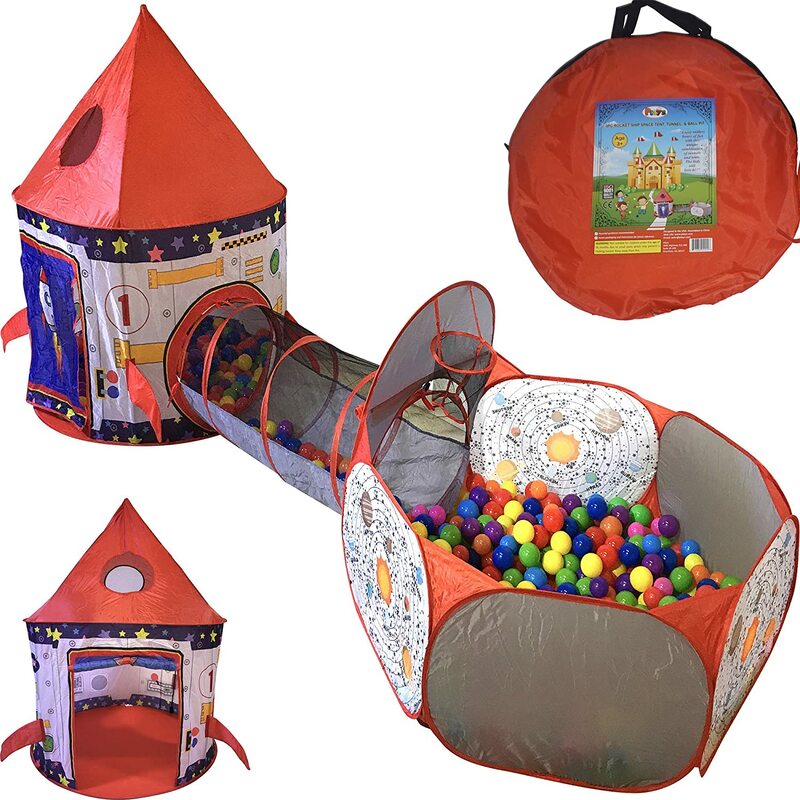 This 3 piece set includes the rocket ship tent, a connecting crawl-through tunnel, and a ball pit! The rocket ship tent features realistic ship component designs on the walls, and the ball tent teaches your little one about the planets in our solar system! The tent is constructed of ansturdy pole frame and breathable mesh fabric for the walls. A thick, soft pad cushions the floor of the tent and ball pit, providing a safer and more comfortable play area for your children. The set includes a carry case for storage and portability. 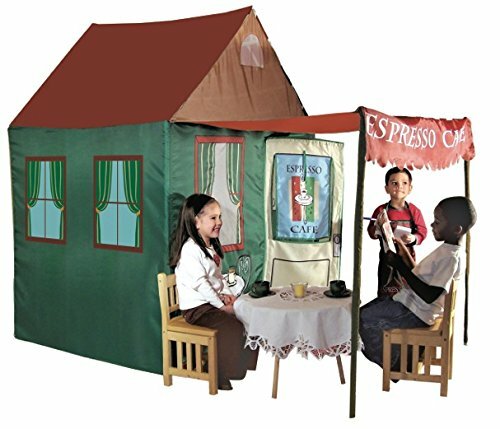 Your little one can serve up brunch and beverages to their friends with this lovely cafe play tent! It features a large awning, a working door with a roll-up window, and a mesh window on one side to provide lighting and ventilation. This tent is very large and spacious! The frame is made of sturdy PVC piping, and the tent and awning are custructed from heavy polyester fabric. 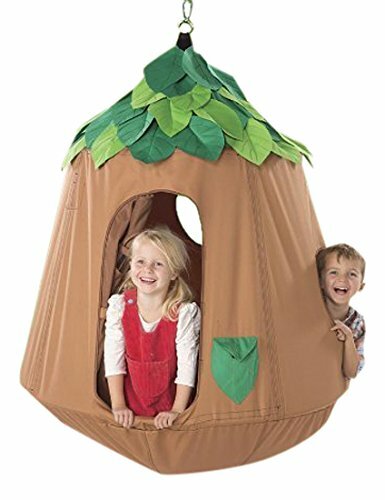 This is a unique tent, and it can be used indoors or outdoors! 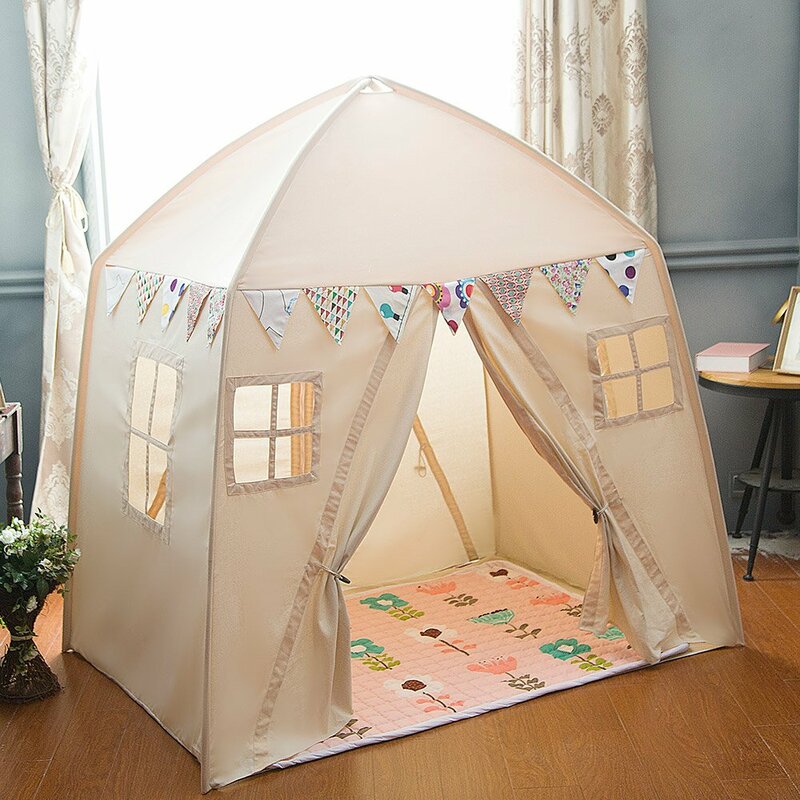 Your little builder will love the fun design of this spacious tent! 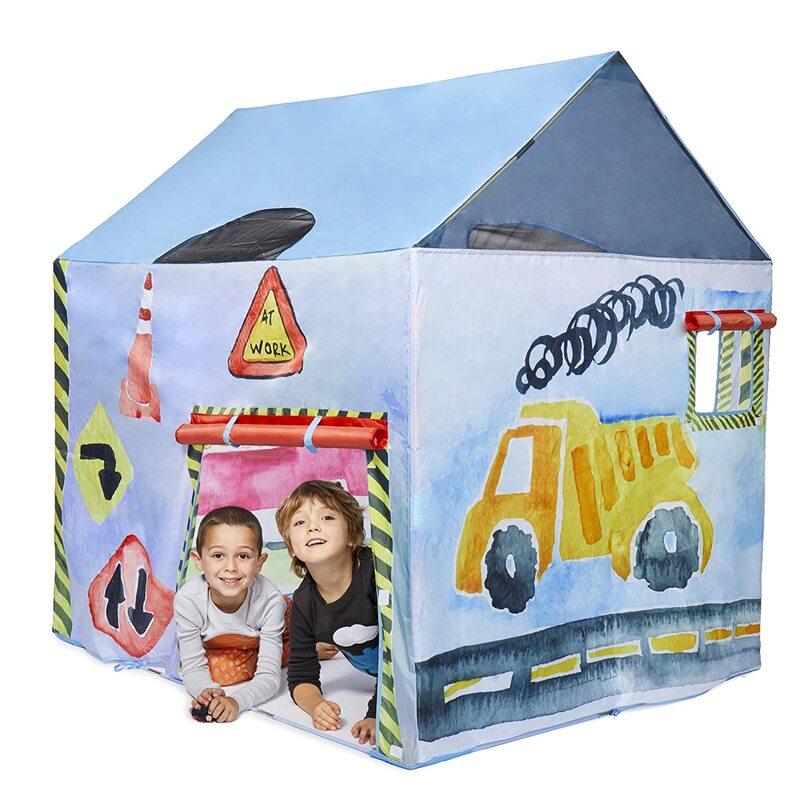 It features a colorful, construction-themed design and roll-up windows and doors with velcro tabs. The roll-up windows feature secret messages that can be viewed when the flap is unrolled! This tent is very spacious and large enough for children to stand up. Construction featues include a sturdy frame with color-coded poles for easy assembly, breathable mesh walls, and reinforced seams for durability. The tent comes with a carry case for storage and portability! 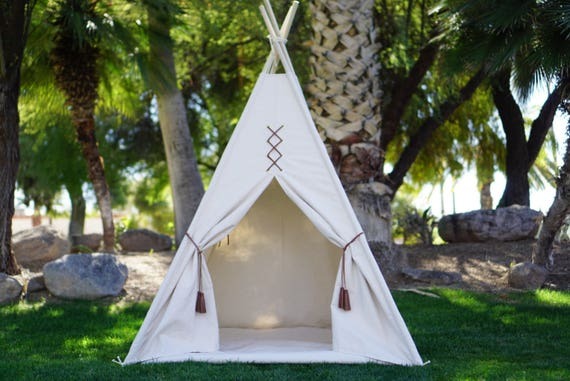 This gorgeous teepee tent makes for a beautiful addition to any room or backyard! It is handmade, making it truly one of a kind! It features a thick, non-slip cotton mat, a window for lighting and ventilation, a small colored flag banner and a sticker set for customization, and a small pocket for storage on one side! The tent is constructed from wooden supports with a wooden stability ball to keep it from collapsing while in use. The canvas is made of 100% breathable cotton, is machine washable, and features lovely pom-poms and lace designs. The doorway can be kept open with the tie straps on either side. It includes a carry bag for storage and portability. This tent is spacious and very large – over 6 ft tall! This quaint playhouse is light in color to allow natural lighting to flow through the tent. The tent features a wide door, four windows, and a colorful flag banner. It is large enough for multiple children to play! The canvas is made of 100% cotton, and also covers the floor. Reinforced seams provide durability. The frame is made from foldable poles which make disassembly and storage easier. The tent comes with a carry bag for storage and portability. This adorable tent is designed after a real home! 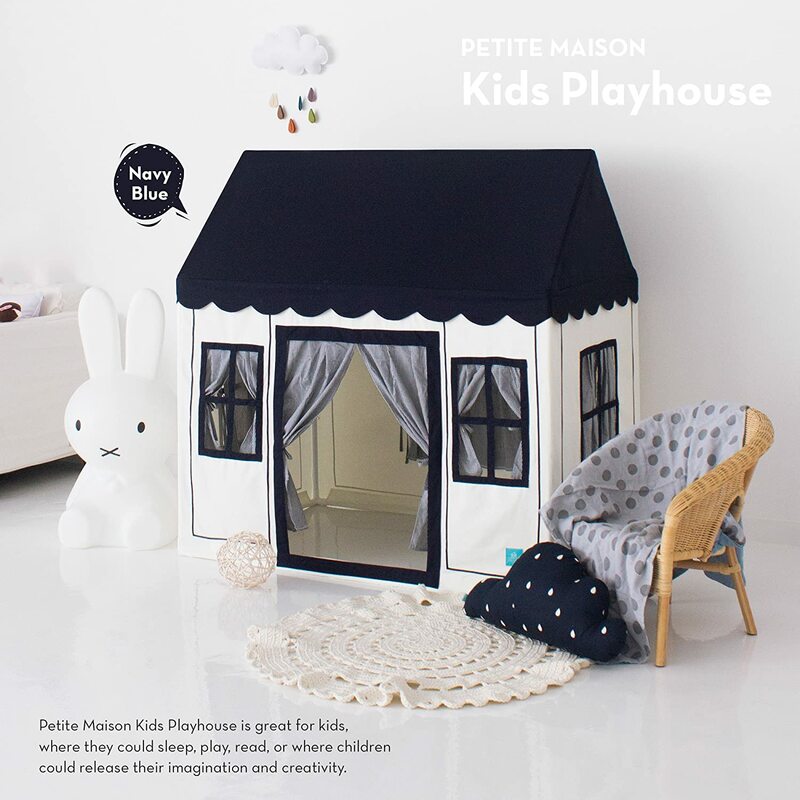 The large windows and doors have closing curtains, giving the play tent a realistic look! The play tent is very large and spacious, with enough room for blankets, toys, and pillows! The canvas is made of 100% cotton, and the frame is constructed of durable aluminum poles and connectors. This tent is handmade, and is ideal for indoor or outdoor use! This is an incredibly unique tent! It’s a hanging tent! The tent hangs from sturdy, powder-coated steel stand, giving your child a tree-house/hammock type hangout spot! The design of this tent is whimsical and natural. The leaved roof has LED lights inside! It has three windows and a large opening for the door. The small outer pocket is great for storage! This fun tent holds up to 225 lbs, letting up to 3 small children play for hours! The stand must be purchased separately. Never use a tent near an open flame or heater. Do not use tents outdoors when lightning is occurring, or during high winds. Tents should be used with adult supervision. Adults should assemble the child’s tent to ensure correct assembly and to prevent collapse.